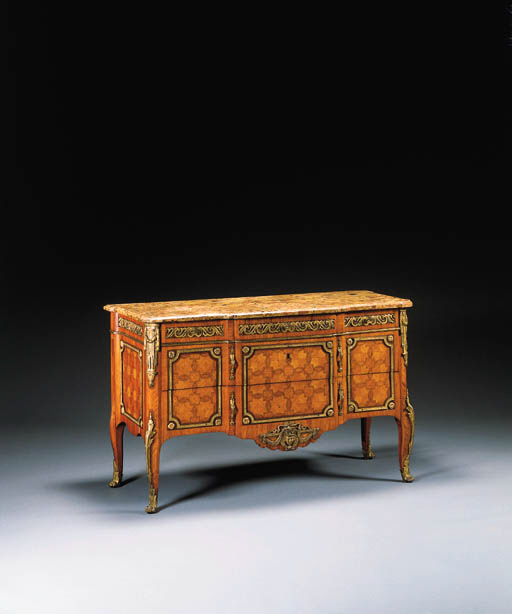 This impressive Transitional commode, by Cramer, with intricate interlaced geometric parquetry offset by Vitruvian scroll and husk swag mounts, is identical to an example in the Musée Nissim de Camondo, Paris, catalogue number 631. A pair of commodes of the same model by Cramer, but with the unusual feature of marquetry tops, previously in the collections of Lady Glenconner and Andrew Mellon, was sold in these Rooms, 5 November 1986, lot 202. Another commode of this model is in the Anthony de Rothschild collection at Ascott House, Buckinghamshire. Another very similar commode but with a different frieze mount, attributed to Cramer, was sold from the collection of the 6th Earl of Rosebery, Mentmore, Buckinghamshire, Sotheby's house sale, 18-20 May 1977, lot 522. The use of intricately patterned geometrical inlay was a particular speciality of Cramer.